Audiovox - Want Movies2Go but don't know how to make it possible? Well look no further! 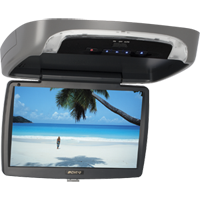 The AVXMTG9B, 9 inch overhead system with built-in DVD player in black, gray, or tan finish is your answer. This system makes hitting the road with your favorite movie possible...so get off the couch and get your Movies2Go!